please don’t initiate a convo when i’m carry doodie – cocoa likes this! one of the most uncomfortable things to me is when a neighbor strikes up a conversation as I’m walking my dogs, carrying sacks fulla doodie. it is especially awkward when I go to wave and then I realize I’m swinging doodie around. next I get embarrassed and sick to my stomach because the tied off bags are not particularly air-tight. this is usually when I break out into a run until the neighbor is out of sight. the man who just moved into the house down the street stopped me and introduced himself. he reached his hand out to shake. do i use my hand that is holding bags of doodie or the hand that is holding the leashes of two (bad) dogs? he then proceeded to tell me his aunt died and he inherited her cat. 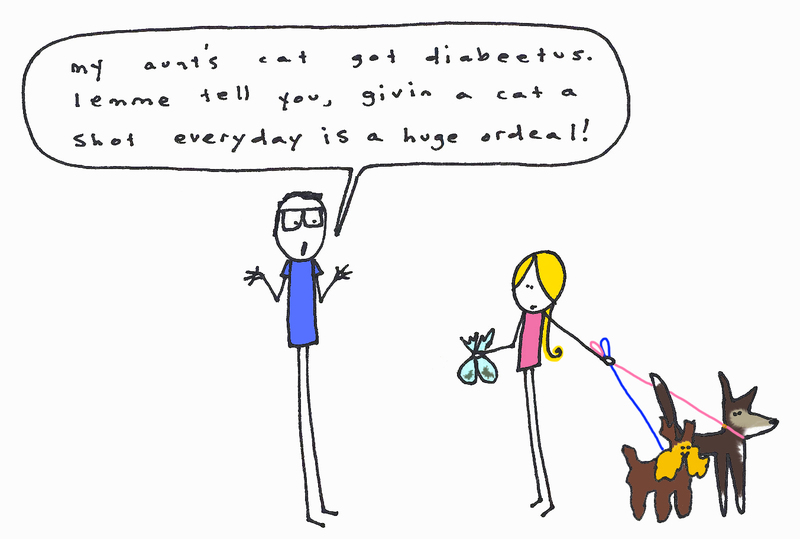 shortly after the kitty was diagnosed with diabetes. now I know all the warning signs for feline diabetes, FYI. he even showed me scars all over his body; they are the result of struggling to give the feline its insulin. but now he has a system, so don’t worry. I’m not really sure why he thought I needed to know all this, unless the moral of the story is: don’t have cats. also, I should probably move to a different neighborhood (one that doesn’t have weirdoes). Previous postarcade themed cakes by cocoa! Next postoh no. i’m goin to jail now, huh?